1.Material: Real Wax + PP. 2.Size: Diameter 2.2inch + Height 5/6/7/8inch. 6.Remote:10-Key Remote Control(Remote control distance of 5 meters). *Keep out of direct sunlight, away from heat sources and out of extreme temperatures or your candle may soften. *This battery candle is made of real wax and is flammable. Do not attempt to light this candle. *To save battery life, You can manually switch off the button underneath the candle. *ANY QUESTION, PLEASE FEEL FREE TO CONTACT WITH US VIA AMAZON EMAIL, WE PROMISE OFFERING YOU A SATISFACTORY SOLUTION . All the Tea Light Candles Sold Exclusively by 5PLOTS. If You're Not Completely Satisfied with Your Purchase Simply Let us Know and You'll be Offered a FULL Refund or Replacement, No Questions Asked. 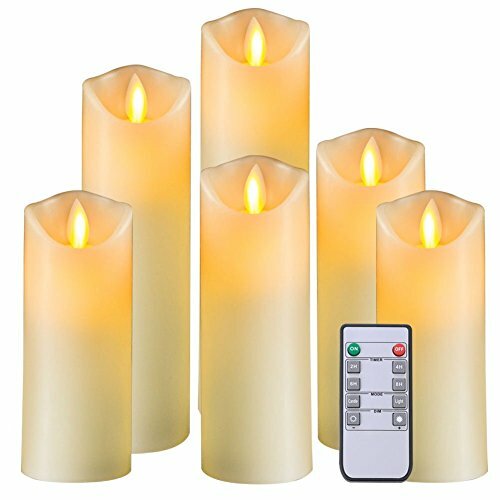 ❤ 6 PACK OPTIMIZED FLAMELESS CANDLE SET: When you unwrap our package with full expectations, you'll get a set of 6 Pillar candles( two 5", two 6", one 7" and one 8", each 2.2"diameter), a 10-key remote control, a user manual. (Batteries are not included in this package), Then you can have a try to put these LED candles on the candelabra on the mantel/in the fireplace or directly on the dining table as centerpieces, which will bring you much enjoyment & pleasure the moment they light up. ❤ AMAZING LIFE-LIKE BURNING FLAME: With a classic ivory color and smooth finish, these paraffin wax LED candles have a very natural look. Plus, The Dancing flame Technology Makes These Wonderful Candles Sway and Flicker Gorgeously and brings a warm ambient glow into your home with this impressive moving wick design. You can illuminate any room in your home without any drawback of bad odor, dripping wax or fire risks of traditional candles, which is completely children and pets friendly. ❤ PERFECT DECORATION: You can truly feel a sense of delicacy & elegance from these 2.2-inch-diameter candles, which will make small and exquisite decorations, ideal for your fireplace, bookshelf, dinning table, windowsills, bedroom, living room or any other places to which you want to add a touch of ambience. ❤ Upgraded Remote Control: For the flexible & convenient operation of all customers, our remote control is made of silicone meterial, raised buttom, comfortable hand feeling, sensitive touching with 16.4-foot range lets you display candles in hard-to-reach places. Each LED bulb delivers 50,000 hours of lamp life, 2 high-grade AA batteries (replaceable) will provide 400+ hours of continuous use, and a 10-key remote control (ON/OFF, 2/4/6/8hrs timer, dimmer control, candle / light modes). ❤ QUALITY PRODUCT AND SERVICE: 100% full function inspection before shipment and warranty of 60 days refund and 12 months return, make 5PLOTS brand LED candles 100% satisfied. If You're Not Completely Satisfied with Your Purchase, please contact us on amazon anytime. our service team will treat and reply positively. If you have any questions about this product by 5PLOTS, contact us by completing and submitting the form below. If you are looking for a specif part number, please include it with your message.